Snake's latest portable adventure could receive the HD upgrade treatment for release on the PlayStation 3. PlayStation 3-owning Metal Gear fans lamenting the existence of Metal Gear Solid: Peace Walker due to lack of a PSP might get a reprieve from their heartbreak in the near future. French website JVN says it can "confirm" that a PlayStation 3 remaster of Peace Walker will be announced at E3 2011. Sony recently revealed its PSP Remaster initiative that'll bring PSP games to the PS3 with HD graphics, save data transfer, and other upgrades, starting with Monster Hunter Portable 3rd. If JVN's report is true, Peace Walker would be the second game to be announced in the PSP Remaster lineup. Sony said PSP Remaster titles could be sold on Blu-ray discs or as downloads through the PlayStation Store, so Peace Walker could go either way. Peace Walker is Konami's second PSP Metal Gear title with an official plot, excluding the card-based strategy Metal Gear Acid series. It features a mission-based structure and co-op gameplay in various modes. 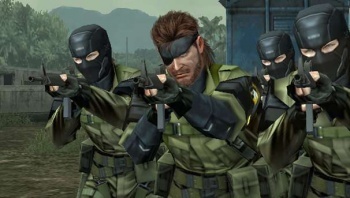 The storyline follows Naked Snake after the events of Metal Gear Solid 3: Snake Eater and Metal Gear Solid: Portable Ops as he builds his group of nationless mercenaries. It'd be a great title for a PSP Remaster due to the popularity of the series, so while JVN's confirmation should be considered rumor for now, it makes a lot of sense. If Peace Walker isn't announced at E3 2011, it'll probably just happen later down the line.